We ran at work into the quite tricky problem to move the “pure” implementation of a feature to some other branch (a quickfix-release) without adding those features/bugfixes from the current master-branch. The feature branch was created some while ago and meanwhile updated from time to time with origin/master. I chose the third option and tinkered in parallel while someone else tried the other path. Yay, two commands to save the day! Around 170 files were affected, so manually doing the application of the changes was out of scope for me. There had to be a feasible Git-solution. Sometimes there is too much whitespace and tabs in my last commit. 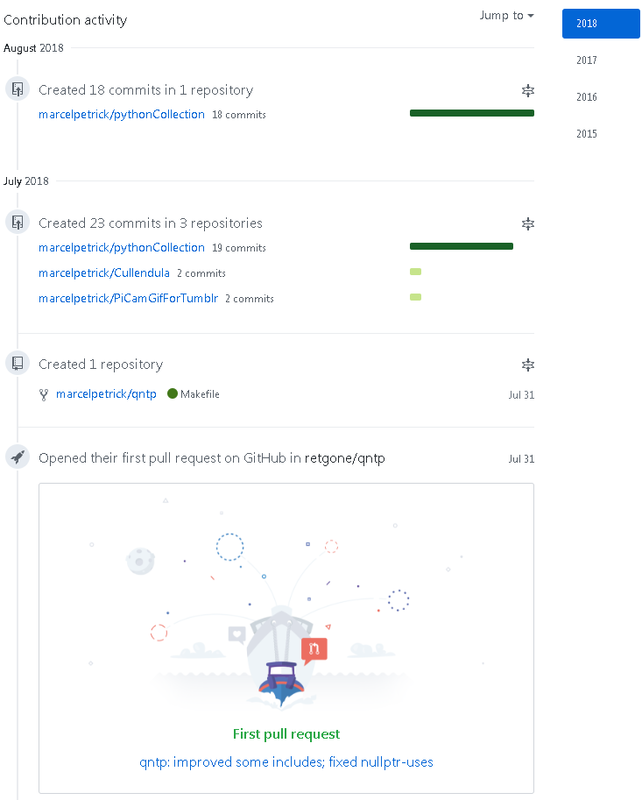 from: https://coderwall.com/p/pek-yg/git-statistics-for-repo-per-author – Thanks Marcin Olichwirowicz! First pull-request on github, yay! I am currently traveling back from my very first paid educational leave. 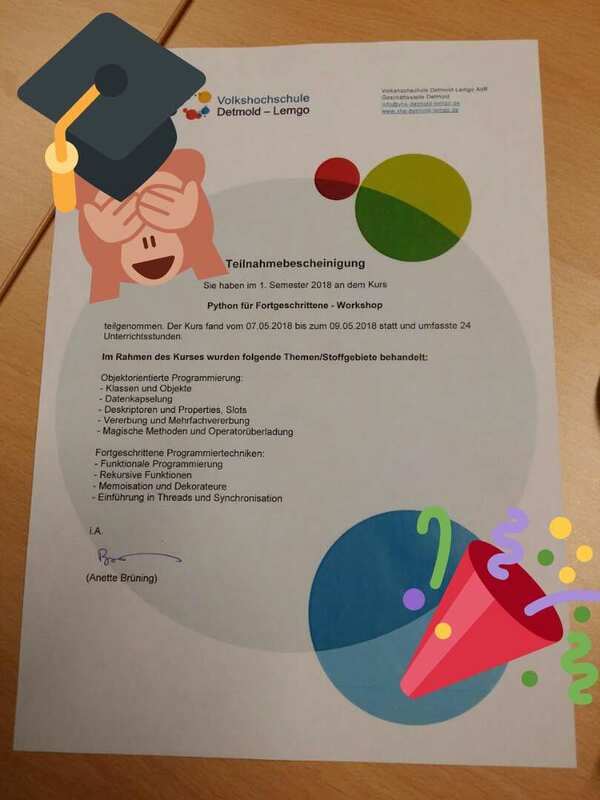 Proper selection, arrangement and preparation lead to some awesome impressions: about the capabilities of Python and about the city of Detmold. 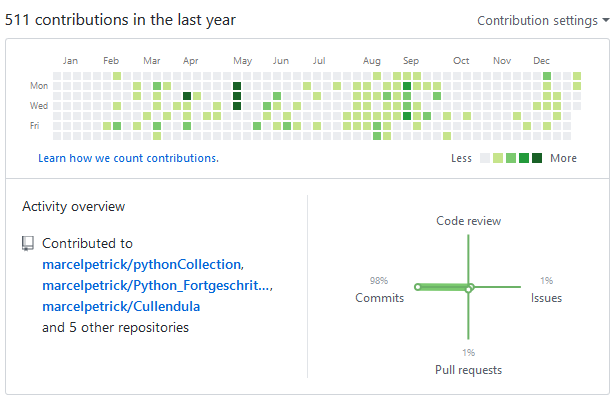 I put all the exercises (full script with my own annotations) into a Git-repository right from the beginning and published it: https://github.com/marcelpetrick/Python_FortgeschrittenenSeminar/. Python was chosen by me by intent: I see and plan for ways to use it with artifical intelligence (TensorFlow-binding ..); microcontroller-programming (ESP can run MicroPython) and for the Raspberry (currently the tumblr-upload-script for the catcam is also Python); for daily data-manipulation-tasks which are currently done more or less on Bash or AutoIt or Batch – and then: write it once, run it both on Linux and Win). This was a great choice! And I want to thank my wife for supporting these stays absent from home and my plan to achieve the wanted education 🙂 And I got a small certificate – but that’s just icing on the cake. My plan as first real exercise is to re-implement the “find all islands in the given map”-programming challenge. This will be fun. Getting to know some specialties and what properties/slots mean in Python-context (compared to the Qt-ones) was nice. And the decorators are a really powerful way to add special functionality to methods without bloating them and without blocking the view to the busines logic. Archiving the whole directory is also an idea, but why not use the integrated functionality? As always: some projects need a first (working) implementation and then over time you can improve them. During lunch I was talking with a colleague about this tool. Then the idea to just use those actually changed files from the current implementation (means: the current branch in Git) shall be used as input. Et voila: consider it done! Also added some fine-tuning to the call-parameter of the script itself, so it can be run as well with some custom string beside “todoM” (which is my marker). Cleaning an implementation of properly tagged lines takes now a second – not minutes (like before!